We are getting excited for the upcoming Canvitational event happening later this month. The lineup is very impressive again this year with Canvitational the only place you can get many of these beers due to their distribution. We wanted to get to know each of the participating breweries a little bit better. So, we've sent out a six pack questionnaire to each of them and we wanted to share them with you. 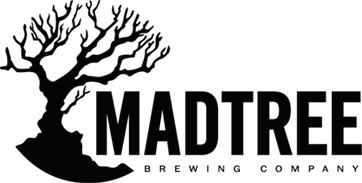 Brady Duncan is and owner and Madtree's Secretary of Beer Defense. Depends on who is the early/lead brewer for the day. Can range from Napalm Death to Old Crow Medicine Show. Yesterday there was some Whitney Houston and Boys to Men playing. It was cool....and weird. We want to be one of the most respected breweries in the midwest. To accomplish this we aim to a) be one of the best employers, b) be a pillar of the community, and c) make some of the highest quality beer found across the county. About 8-9. There are a few swingers in the group. 4. Which beers outside of your own do you enjoy? What beer do you wish you came up with? We like a lot of beers. Rather than specific beers, we have a lot of respect for breweries that create a great portfolio of beers. Stone, Russian River, Fatheads. Locally, Yellow Springs out Dayton and Blank Slate out of Cincinnati are making great beer on smaller scales. Lift, but's it a go to all the time. 6. What do you drink when you aren't drinking beer? Mostly water. Lately Root Beer since we've started making that. We stay away from Mike's Hard. The 2nd Annual Sun King CANvitational will take place in the heart of Midwest – Indianapolis, IN. Located on Georgia Street, known for Super Bowl XLVI festivities and Pan Am Plaza, the CANvitational is set to showcase 40+ craft breweries from all over America who CAN. On Saturday, September 20th, 2014, the 2nd Annual CANvitational will enlighten patrons to sampling craft beer from award winning breweries from across the USA, enjoy local eats provided by local food trucks and music that will be sure to get you dancing in the streets, in an urban downtown atmosphere. Tickets are available and the event will feature some familiar breweries, as well as many out of state. You can find more information about them and the event at http://canvitational.com/.